Romantic baptismal kit for boys and girls. Gentle colors combined with gray and brown. The candle is adorned with fabrics of both colors, forming a large bow on which they are tied with brown cords decorated with beads, wooden children's trains. The same wooden trainers decorate the bottle of oil, all three candles. 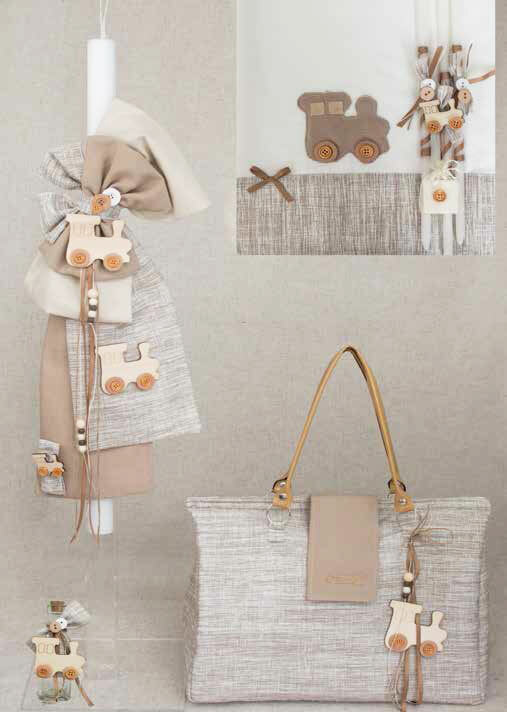 The set has a large gray bag with brown leather handles in which a string of beads hangs and a wooden train. https://www.preciousandpretty.com/2018/07/train-lampada-baptism-set-for-boys-e809.html Greek Wedding Favors|Orthodox Crowns|Stefana|Baptism Invitations Train lampada baptism set for boys E809 Greek lampada baptismal set with cute wooden kid toy trains. Product #: Greek Wedding Favors|Orthodox Crowns|Stefana|Baptism Invitations_7057743512054872192 5 stars out of 5 reviews.